Is India’s Ministry of Coal Effective in Supporting Coal Production? Coal is a nationalized industry in India, and Coal India Limited (CIL) is the state-owned company responsible for coal production. Prior to 1991, the government set the prices that companies producing steel, cement, and power would pay for coal. Economic reforms replaced this system with one that allocates coal blocks to individual public-sector entities and private companies. 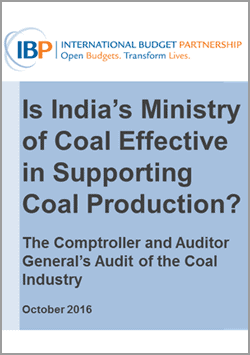 But the gap between the demand for coal and the supply continued to widen, so the Comptroller and Auditor General (CAG) of India conducted an audit investigation to examine the adequacy of the administrative system. The audit exposed lack of transparency, gross irregularities, and inefficiency in the process during the period of 2004-2009. This case study details the findings and examines the impact of the Comptroller and Auditor General’s 2012 audit report.